Sometimes I want a good slice of quiche with a side of salad on a Saturday afternoon. Something that I cannot go pick up at the store, not even the health food store. The freezer section has gluten free crusts, but never dairy free and soy free too, which leaves me to the old-fashioned way. My Grandma would be proud, considering I would not care to hang out in the kitchen as a little girl. My grandmother would make everything from scratch. My favorite was her pickled watermelon and cinnamon rugelach. Yes, pickled watermelon, tastes way better than it sounds, really. Yes, this recipe does take some time and patience, but it is sooo incredibly worth it. I make the crust on Friday so it’s ready for the next day, then bake it Saturday morning. This way it doesn’t feel overwhelming to make the crust and filling all at once. I am not about being in the kitchen for hours over a meal, no way, and am sure you aren’t either. We love anything with a crust and a creamy, custardy filling around here. Sweet onions complement this recipe. It balances the savoriness with a belly-happy satisfaction. I have made other quiche recipes gluten/dairy/soy free, yet I find adapting Thomas Keller’s recipe is the best. It comes out so light and sky-high, just like his, which I am proud to say, as he is my favorite chef of all time. Being able to adapt his recipes puts a big smile on my face. Okay, I will stop now. I just had to share that with you. The crust tastes like there is butter in it, seriously, that good. You can also make this with any seasonal vegetables you like. For the spring, asparagus or english peas are awesome. 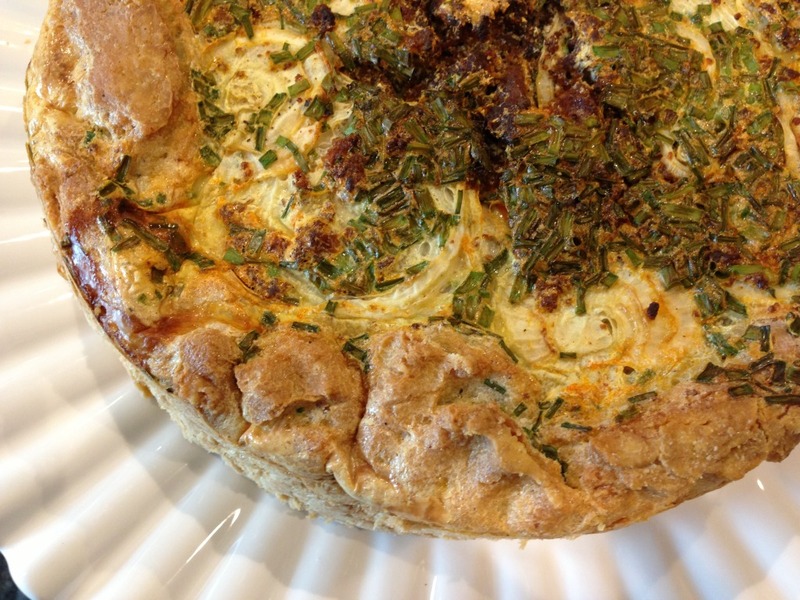 Or parsnip and fennel as a seasonal winter quiche. Ooh, I may do that next month. I’m going to try a butternut squash and sage version this week with all the beautiful squash in season now. This is a lovely dish to serve for brunch. It’s an easy reheat kind of dish. I usually serve it for lunch with a side of kale/mixed greens salad with a shallot or honey mustard vinaigrette. Food should always be this good. Who says gluten free, dairy free foods tastes flavorless? Have them try a slice of this savory happiness…enjoy! Lightly spray the inside of the tart pan, set aside. Combine GF all purpose flour with kosher salt and non-dairy butter. Using a pastry cutter, push pieces of non-dairy butter into the flour until some stickiness has formed. Add a little ice water then incorporate the liquid into the dough, add the remaining ice water and repeat. It will still appear dry. Add vinegar and work the dough again until most of the flour has been absorbed into the dough. At this point, form the dough into a ball. Lightly flour parchment paper to roll out the dough then place dough on paper. Pat down then lightly flour the top of the dough and cover with another sheet of parchment paper. Roll it out as thin as you can then lift the parchment while the dough is still on it and reverse flip it into the tart pan. 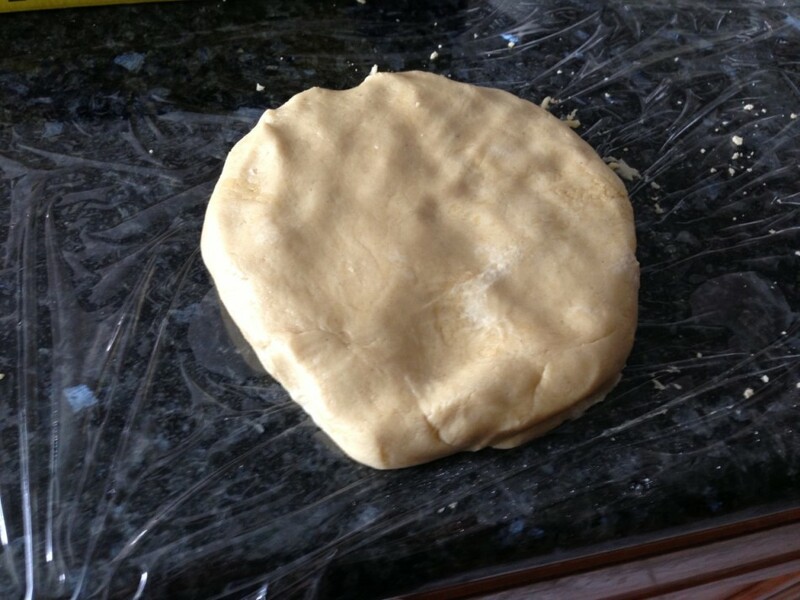 Gently spread out and redistribute the dough as needed and fold in the edges to create an edge. It’s okay if your dough breaks apart, it happens to me all the time. Not to worry! Because it’s gluten free it doesn’t have the glue to keep it together like gluten flour, but pressing pieces together as you work the dough will do the trick. Reserve any remaining scraps just in case there are any cracks in the crust during the baking process.Refrigerate the unbaked shell for 15 minutes. Meanwhile, preheat the oven to 375 degrees with the oven rack placed in the center. 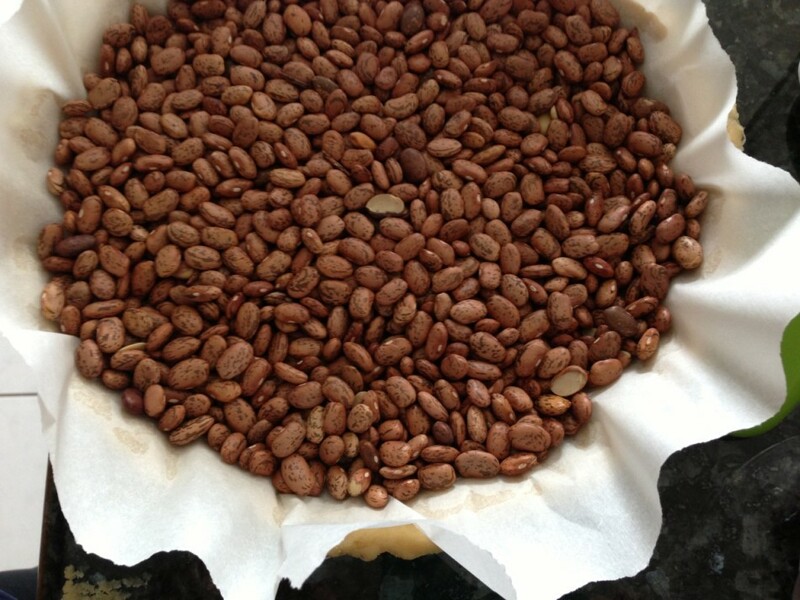 Once chilled, place a sheet of parchment paper directly over the crust shell including the sides, evenly spread out pie weights or dry beans to weigh it down. Do not push the weights down too much, otherwise, the paper may stick to the dough during baking. Place the tart pan on a rimmed baking sheet and blind bake the crust for 25 minutes. Slowly and carefully remove the parchment paper holding the weights. Check for any new cracks in the crust, patch with the reserved dough if needed. Remove from the oven and allow the shell to cool on the baking sheet while preparing the filling. Combine coconut milk, eggs, kosher salt, nutmeg and thyme, mix well using a handheld mixer set on medium-high speed until it begins to appear frothy, about a minute. Add sliced leeks, onions to the tart pan. Then slowly add egg mixture. Bake for 90 minutes until set. Note: Check your quiche after 85 minutes as ovens do vary. You may only need 85 minutes or as much as 1 3/4 hours. It is ready when the custard has only a slight jiggle and lightly browned. Let it cool at least 30 minutes before inverting it from the pan. Serve warm or at room temperature. Note: The quiche will not cut well if it’s hot. This quiche can be made up to 3 days in advance and still taste just as delicious. *If making ahead, preheat your oven to 375 degrees F. Line a baking sheet with parchment paper and lightly spray with oil. 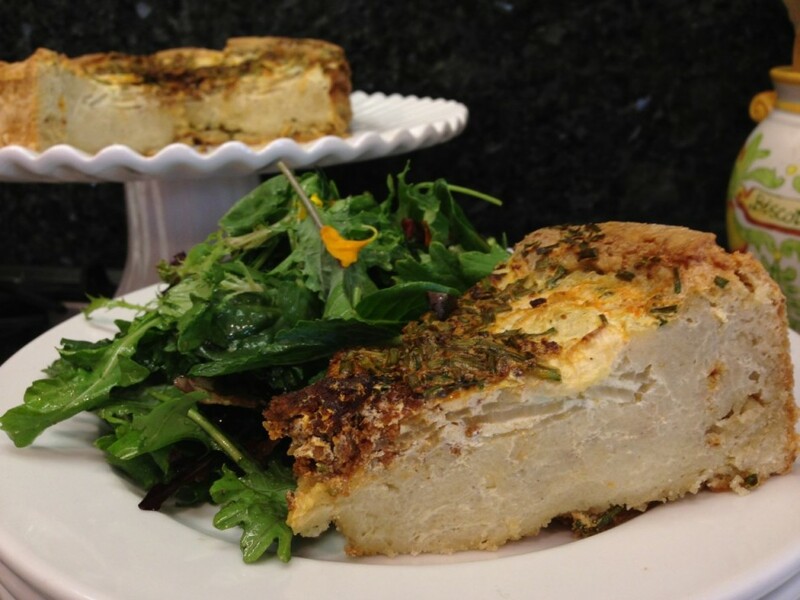 With a serrated knife and supporting the crust, carefully slice the quiche into 8 pieces. Place slices on the baking sheet and reheat for 15 minutes. Insert a metal skewer in the center of a slice for several seconds and then touch the skewer to your lip to test the temperature. Serve warm or room temperature. This looks delicious and I want to make it today. Can I freeze the crust then bake the quiche without it getting soggy? Hi Beth, Yes you can freeze the crust, but make sure to wrap it well (a couple of times) in plastic wrap. Then defrost in the fridge before blind baking (baking with the dry beans as on the recipe post). Happy Baking! 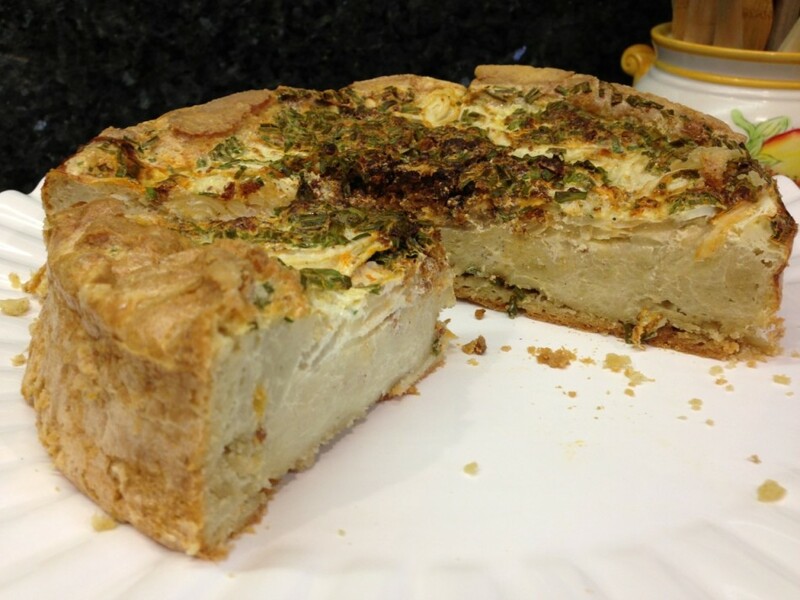 Your quiche looks amazing and I want to make this recipe but I haven't made a crust before. Do you recommend any tips for someone like me? Sondra, whats wonderful about gluten free crusts is you do not have to worry about overworking the dough so if it breaks just piece and paste it together. My crusts break all the time when I transfer them to the pan! I think if they didn't it would be because I have too much flour in it holding it together thus making it dry. However, if you do see the dough has gotten soft when pressing to fill the pan, and warm, then chill it in the refrigerator for 15 minutes before blind baking. This will help set the margarine in the crust and not spread too quickly creating a flaky crust. Enjoy! I just came across your blog after finding this quiche that I will be making for family brunch this weekend. It looks too good to resist. Wish I found your blog sooner, so many recipes that look great! This is one impressive gluten free, dairy free quiche. We cannot have coconut, can I use soy milk or almond milk? I would love to try your recipe this weekend. Thanks. Yes, soy or almond milk will work well as substitutes for creamer and milk. Enjoy! I couldn't find Hawaiian onions so I used sweet onions instead and it came out delicious. It wasn't as tall as yours, maybe because I mixed it with my hand mixer. The flavor was there and it wasn't salty like many quiches I've had. Everyone loved it with salad on the side. Nice recipe. 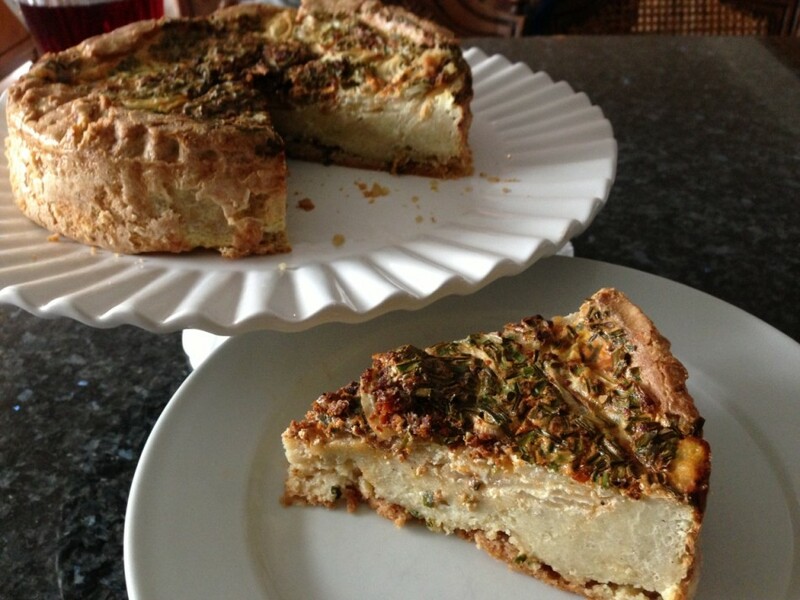 What is your recommended brand of flour blend for this quiche? Do you use a different flour blend for your other recipes?